Luminous efficiency: ratio of the total luminous flux radiated to the power absorbed. Ever since its first appearance in the market, LED’s luminous efficiency has significantly increased. Today’s medium-level range products are 4 times more efficient than the best models available in 2006. 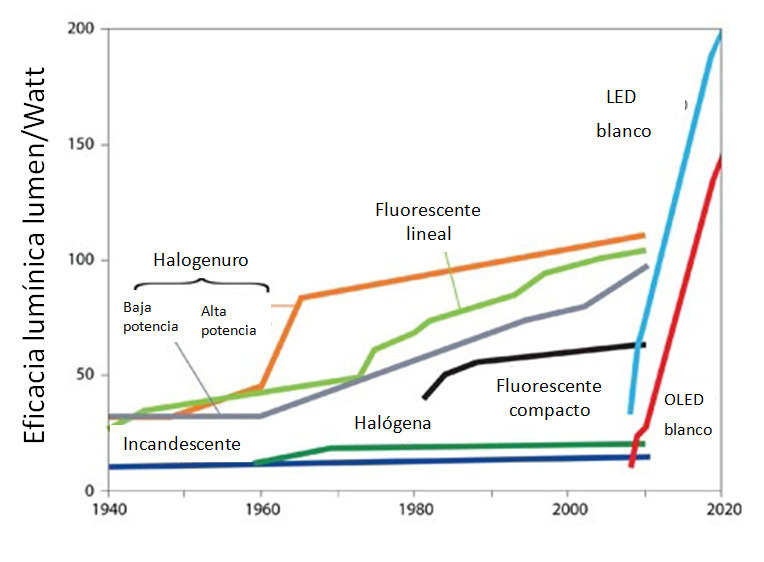 This evolution caused LED to position itself, from an energy performance standpoint, far above the remaining options in the market, as shown in the following chart. Regardless of the light source we use, we have to consider the need to use lenses, reflectors and any other system in order to get a specific light distribution, which decreases the amount of light really emitted. With the use of LED, this reduction is less pronounced than with the other light sources, because its smaller size allows for a better optimization of the lenses design. The difference is especially noticeable when more intensive lenses are used. That’s why reality is even more favorable to LED than is shown in the chart. 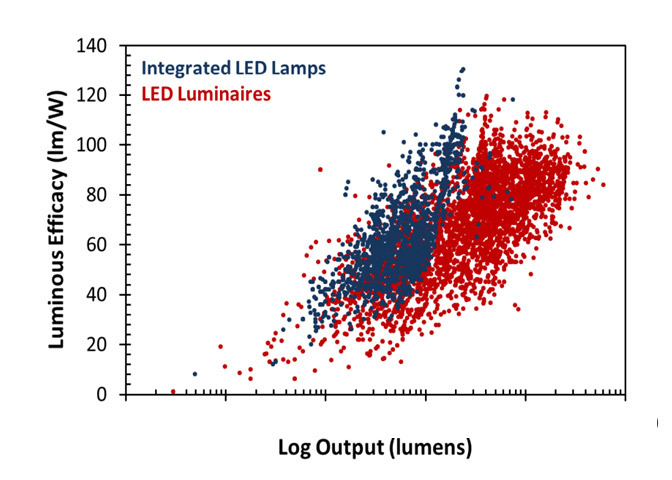 The specific values shown help us understand the position occupied by LEDs compared to the other light sources. But we must highlight that we are speaking in generally, which may lead to confusion. As in any other field, there are different quality LEDs and their efficiency might vary up to a 50 per cent. Even inside the same product family, the warmest models have a lower efficiency than the coldest ones; and the ones that offer the best color reproduction are usually the less efficient. It is clear, then, that the previously mentioned values [lm/W] are subject to a great variability depending on each specific model. This gap is visually obvious in the above figure, that represents the range of efficiencies existing in the market for different light flux LEDs. The LED-efficiency binomial —that many people have embraced— can give the illusion that the simple fact of including LEDs in a Project means that you are working with the most efficient solution. The truth shows that the options existing in the market offer very diverse results. «Using LED» is not enough; we must choose high quality models whose features (lenses, IRC, Tcolor, etc.) are also suited to each specific application.